Thanks to Middlesbrough for making the quarter finals of the FA Cup. Not only were they brushed aside by Manchester City, their presence in what used to be called the Sixth Round, spared us from having to go there on a Saturday and thereby probably spoiling our weekend. Sixth Round day brings back fond memories of playing Manchester United in 1964 and being 3-1 up with ten minutes to go, seeing Ron Guthrie scoring his only goal for Sunderland as we did to Luton Town what City did to Boro and bagging a draw at Stamford Bridge thereby allowing us to bring Chelsea back to Roker and give the old stadium its last great FA Cup night. But now it is the Quarter Finals and the chances of a shock were about as remote as Nicola Sturgeon donning a John Bull waistcoat and giving us a rousing chorus of The Roast Beef of Old England as City, Arsenal and Spurs romped through without conceding a goal. That left Chelsea to play Manchester United in one of those games that many would like to see both teams lose, myself included. 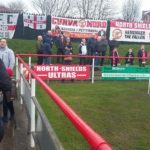 It allowed me to dip into the Northern League and a visit to the Daren Persson Stadium, North Shields for their clash with Shildon. The ground sits on the edge of the Meadow Well estate and is known to the home fans as The Morgue as club sponsor Mr Persson is a funeral director. Shields used to have a wonderful ground at Appleby Park which was sold for housing and, after a few years of playing on public parks, they took this piece of land and have turned it into a perfectly adequate stadium for the level they play at. Two years ago to the weekend I saw them win the first leg of the FA Vase semi-final at Highworth in Wiltshire en route to a Wembley victory over Glossop North End (quiz question; what is their claim to fame?). Now, two years on, they sit at the top of the Northern League First Division and are hot favourites to win the title only three years after coming up from the second. They were eleven points ahead of cross Tyne rivals South Shields and at the end of the game, they extended that to 14 as they dispatched M Salut’s home town team by three goals to nil. They played well and I had no problems with the result. I did have an issue with a small minority of the home support who seemed to think that it was perfectly acceptable to drink on the terraces, swear vociferously and roundly abuse Shildon players and Shildon supporters. The atmosphere was edgy and unpleasant and does not show the club up in a very good light. 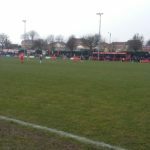 Much of the animosity arose from earlier in the season when Shildon knocked the Robins out of the FA Vase and there were shenanigans during and after the game. I wasn’t there so I cannot comment but it is rare that older, sensible Shildon supporters will not travel because of what they see as an aggressive and intimidating atmosphere. Once again that dreaded word “Ultras” was emblazoned on banners in a corner of the ground. Unlike the ones in Marseilles who set themselves on fire the night M Salut and I saw Olympique play Troyes, these are not necessarily organised gangs, more people who show their support in extreme ways. One man had his bald head tattooed proclaiming his allegiance to extreme Protestantism while others swore allegiance to “the Toon” who were going down to a stadium emptying 3-1 defeat to Fulham. 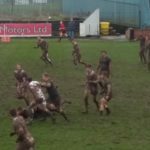 The next day, after feasting on Channel 5’s highlights show (getting practice in for next season), I took off on a coast to coast trip to watch some rugby league in wild and woolly West Cumbria as Whitehaven took on Toronto. I thought long and hard about this. Whitehaven is at the centre of the Copeland constituency where a Tory won the seat from Labour in a by election. This despite the fact that the local hospital will be downgraded to the level where Doctors Cameron and Finlay (and probably Dr Snoddie) would feel comfortable and the local Academy is a byword for inefficiency and poor standards. Sometimes though, you have to swallow your principles and I wanted to see this new addition to the Rugby League Division One. Playing out of Toronto, Ontario rather than Toronto just across the bridge from Bishop, they are mainly UK players based in Brighouse. Most have plenty of experience of Championship level rugby league and a few have played in Super League. A Canadian entrepreneur feels that the game could take off in the land of the Maple Leaf and is convinced that Super League and visits from Leeds, Wigan and Castleford are two years ahead. 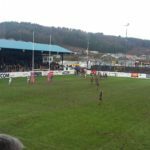 They won their opening league game 76-0 against London Skolars but the trip to Whitehaven was a different experience altogether. It had rained for two days in West Cumbria and the pitch was messy. After the warm up it was very messy and ten minutes into the game it had cut up. What we got was the kind of mud bath that Eddie Waring used to commentate on in Grandstand in those black and white days of Alex Murphy, Don Fox and pigeon fancier Keith Hepworth. Halfway through the first period it was difficult to distinguish who was who as the game was now between Whitehaven Mudmen and Toronto Mudmen. The kits were caked in mud as were the player’s legs, faces and heads and the ball was as slippery as Alan Pardew. It was great. Toronto led 14-0 at half time with at least one dubious try and never looked likely to relinquish that lead. The second half was drawn 10-10 leaving the Mudpack with 100 per cent record after two games and sitting on top of the table, level on points with Barrow, Hunslet, Doncaster and Newcastle. It was a pleasant day with a stop at the Llama Karma Kafe near Penrith (I heartily recommend the cherry scones) and the usual inspiring drive through the Lake District before the rain started somewhere near Cockermouth. Unfortunately, I had to put up with Alan Green’s commentary on Liverpool v Burnley on the return journey which kind of took the edge off the day. No such pleasures next Saturday as I sit grim faced in my seat at the Stadium of Light, expecting Burnley to break their away duck and begin the process of Prexit. I live in hope that all three North East clubs will be locking horns on Channel 5 next year. That brings back memories. Where’s Janet? Classic article…you should copyright “Prexit” and make a fortune. I once drove from Stockport, where I was working for a short time, over to Glossop to meet my old boss. We went for a fabulous meal in a great pub that had an Indian restaurant. It was the night we lost to Man Utd and Micky Gray was sent off. Anyway, my boss mentioned Glossop were once in the first division for a season in the early 20th century, I checked it out later and sure enough they were, we drew with them at their place and beat them at Roker. Judging by the fabulous scenery on my drive there, I will hazard a guess and say their claim to fame was the highest ground in the country? Not quite David. It’s the smallest town ever to have had a team in the top division. There now,that’s made your day? ?